The European Union wants Kenya to set a date for its next elections and pass laws ahead of time to avoid a repeat of chaos that erupted after the last national polls in east Africa’s biggest economy. Lodewijk Briet, the head of the EU’s delegation to Kenya, said on Thursday there had been progress on political and judicial reforms but more needed to be done to ensure the next elections would be peaceful. Briet said Kenya risks losing international goodwill and possibly further funding for reforms if it continues to act slowly in implementing the constitution. The EU has been partially funding the reform process, Reuters reports. Opinion is split among some legislators and the Commission on the Implementation of the Constitution (CIOC) over when the next national polls are due, and there has been some public debate over the issue, but no formal decision has been made. “A lot remains to be done and there is little time left. It is important that Kenya reaches an agreement for the date of the next election,” Briet told a media conference after meeting with the CIOC to review progress on the basic law. Kenya’s new constitution aims to check presidential powers and curb the corruption, political patronage and tribalism that have plagued Kenya since independence in 1963. It requires about 40 new laws to be enacted to become operational. The former British colony’s reputation for stability was shaken when tribal violence erupted following disputed polls held in December 2007. Peace was restored by a power-sharing deal brokered by former U.N. Secretary General Kofi Annan, creating Kenya’s first coalition government. The constitution was a key component in an accord signed by Kibaki and Raila Odinga, then Kibaki’s political rival and now prime minister, to end the bloodshed. The CIOC says the basic law requires that the next polls be held on the second Tuesday of August, every fifth year, which will fall on August 14 next year. 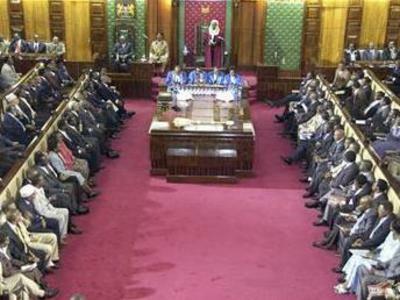 However, some MPs say the term of parliament expires in mid January 2013 — five years after they were sworn in as legislators — placing the date of the vote in early 2013. Neither the Attorney General nor the minister for justice was available to comment on the likely date for the elections. Lobby groups say that with the elections drawing closer, lawmakers may try to delay the implementation of the new basic law and push back the vote from August. Laws on the creation of an authority to delineate new constituencies and election oversight have yet to be passed. “The timeframe has been tight all along, and it is a matter of concern to unnecessarily delay this process even by a single day,” said Charles Nyachae, chairman of the CIOC.